Arc Energy Resources specialises in the supply of corrosion resistant weld overlay cladding and the manufacture of specialist fabrications for the nuclear, oil & gas, renewable, water & wastewater, rail and naval industries. Arc Energy prides itself on the skill, resourcefulness and innovation employed by its highly qualified and experienced team to find solutions to welding and engineering challenges. As a leading global supplier in the design and manufacturing of high integrity heat transfer and specialist pressure equipment, Graham Hart (Process Technology) Ltd required Arc’s sought-after ASME U Stamp accredited capabilities for the welding of a large heat exchanger to be used for a prestigious project they had secured. The tubesheet and end plates are integral components of Graham Hart’s growing range of HPHT (High Pressure High Temperature) heat exchanger designs. Graham Hart are ASME U Stamp holders, but had to contract the work out to a fellow U Stamp accredited company in this instance. There are very few companies in the UK that are U stamp holders specialising in weld overlay cladding. Arc Energy have the knowledge and technical prowess which made the choice a simple one for Graham Hart. The pressure of time was evident from the outset, with an extremely stringent deadline that had to be met without fail. Adding to the time pressure, the ASME U stamp accreditation can be time-consuming and easily delayed if insufficient paperwork and traceability is presented to the Lloyds Register inspectors. Everything would have to run smoothly for the project to be successfully completed on time and to budget. Arc Energy are specialist welding engineers with a wealth of knowledge and experience across the company. Our experience in designing solutions for countless welding projects gives us the confidence that we can complete projects of any scale to the highest standards. Arc made the decision to utilise TIG welding processes and use multiple stations to complete the job efficiently. The TIG welding process allowed for clean, high quality welds making it ideal for the project. Using the TIG process, with multiple stations and no delays during machining and fabrication, the heat exchanger left Arc’s workshop two weeks earlier than the deadline. This delighted Graham Hart as well as everyone at Arc who were part of the successful delivery of the project. 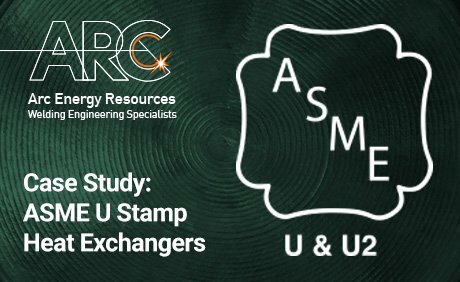 The ASME U Stamp was achieved with no delays thanks to Arc’s experienced Quality Department and Graham Hart’s exceptional cooperation.